Look who's having a baby! It's our friend Ro! She and her husband, Chris, are in our close group of friends. As soon as I heard she was pregnant, I knew I wanted to help throw her shower. Luckily Sarah and Amanda were happy to help. 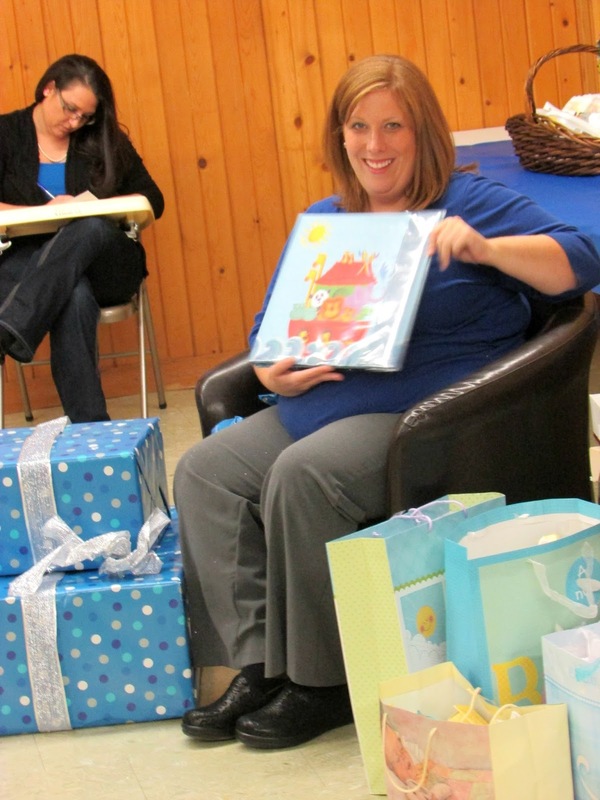 We are so excited for them and had a great time planning her shower. Sarah did an awesome job on the table decorations. Each of those pom-poms in anchored by a bundle of diapers. They turned out so cute! She also modge-podged bottles that made really cute vases. Not to mention all of these little owls! 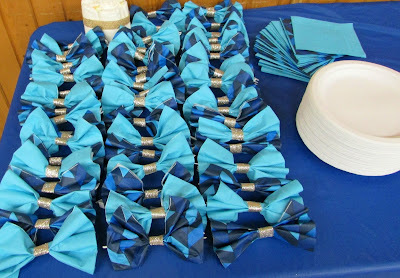 They were in all sorts of colors and were perfect with the theme! 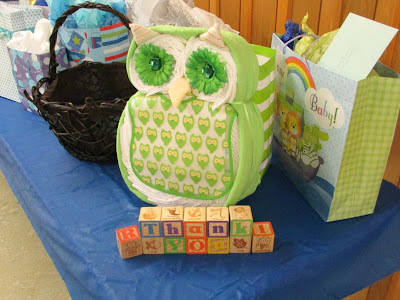 Amanda made a great owl diaper cake for the gift table and a few of Jax's blocks came in handy telling the guests Thank You for coming. Sarah found a cute cake mold. She made 4 cakes and one cookie. She, her mom and aunt decorated them all as well! They turned out so darn cute! Amanda came up with some cute games to play. 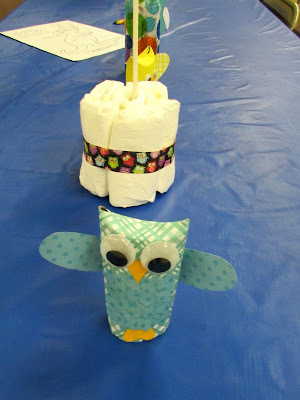 She also made the cutest little owl gift bags for the prizes! 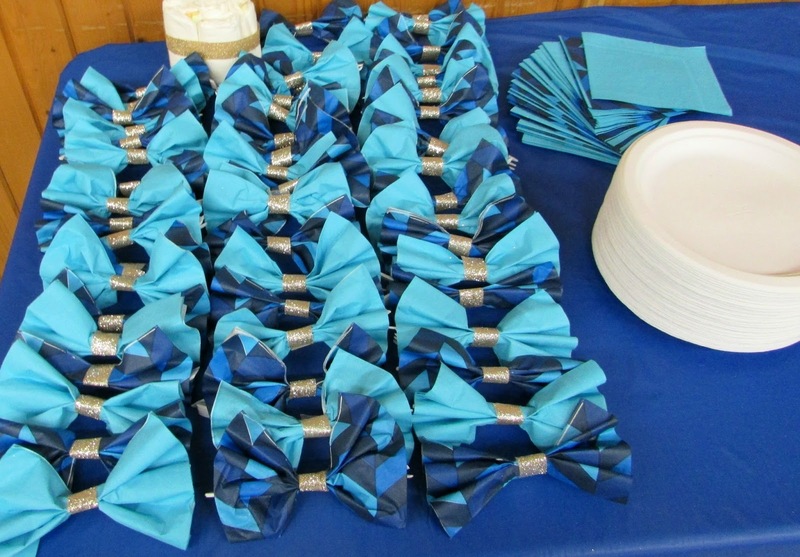 We had the silverware and napkins bundled into little bow ties. Amanda made the cutest little baby carriage deviled eggs. Cheese is one of Ro's favorite foods, so we had plenty of mini cheese balls. We focused on munchable foods like Ro's favorite popcorn, Chex mix with owl shaped cheese crackers, little smokies and meatballs. We also had plenty of drinks and sweets. Ro requested Aloha punch and we went through almost two full batches! We also had brownie batter puppy chow and Sarah's request of peanut butter pie with chocolate covered pretzel crust. And of course there had to be sugar cookies. I made of my go-to cookies with a little bit of a twist. I can't wait to share that with you guys! We had the best time putting together a party to celebrate Ro and the little guy. We hope everyone went home with full bellies and hearts. One thing is for sure, the baby will be surrounded by lots of love! Love all the cute owl things at the baby shower!! Thank you! We had so much fun planning it and seeing it come together! Aww what a cute baby shower for your friend. Thanks for sharing this at Cooking and Crafting with J&J. Thanks Julie! We had a lot of fun planning it! 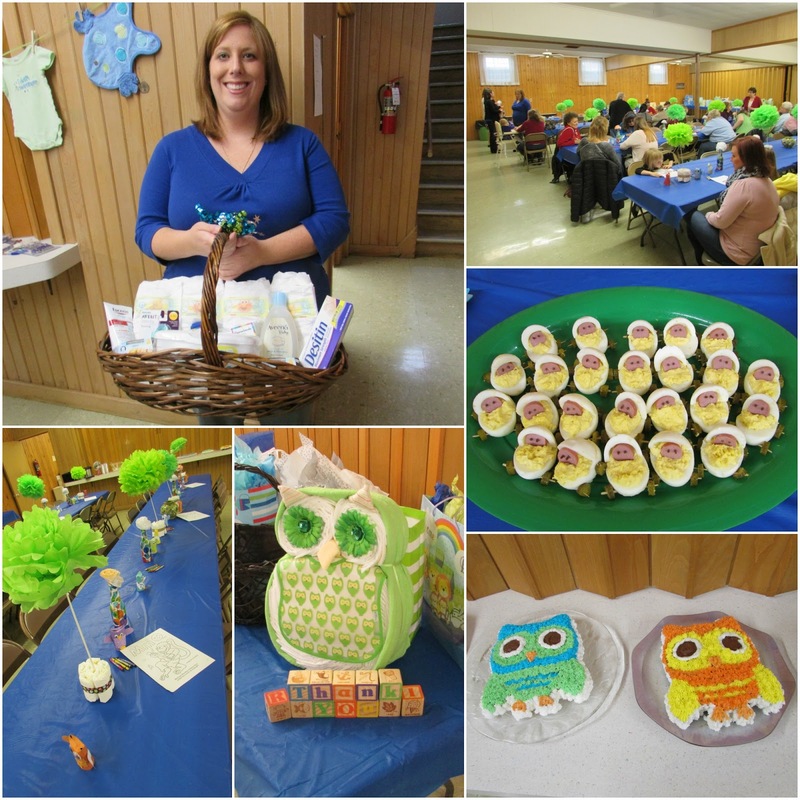 What an adorable baby shower you put together. Such clever ideas, I especially love the eggs :-) Thank you for sharing with the Clever Chicks Blog Hop! I hope you’ll join us again next week! Aren't those eggs the cutest?! I am sure you have plenty of supply for such a thing! Looks like such a fun party! I love all of the owl details. Thanks for sharing with us at the Merry Monday Link Party! Hope to see you again Sunday night! Thank you! We had a great time pulling it all together! Looks like a great party. What a great idea to use nappies to ground your decorations. 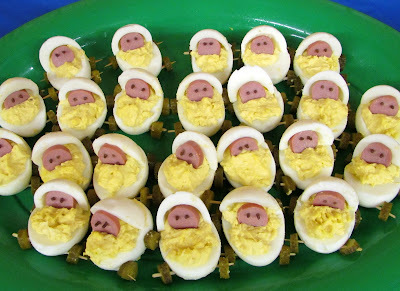 And of course I love those cute deviled eggs! Thanks for sharing with the Blog Fair. I loved that too! Then we had more diapers to give her after the shower rather than having some sort of decoration we would only use once! Aren't the deviled eggs great?! Thanks so much for hosting! Oh my goodness Carlee! 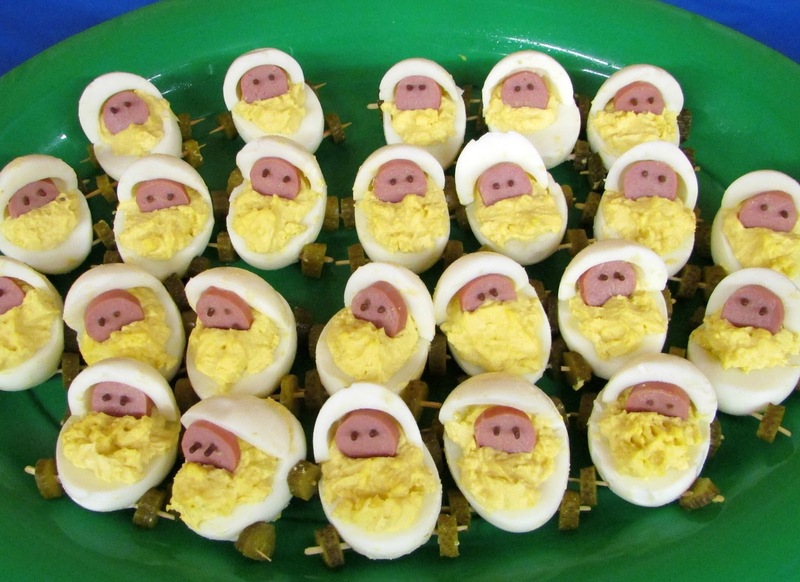 Those baby carriage deviled eggs that your friend Amanda made are the cutest things ever! I couldn't even imagine making those. I have a hard enough time making deviled eggs look edible, let alone making them into something so cute! 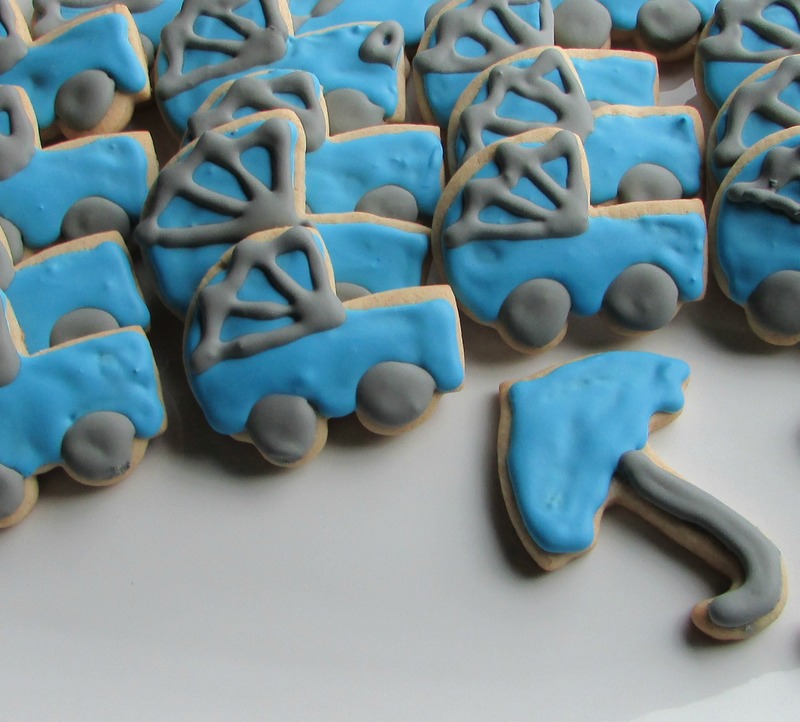 The baby carriage cookies are perfect as well. Thanks for letting us catch a glimpse of the party and for sharing at Talented Tuesday. Aren't they the best?! I love how cute they turned out. I am definitely stealing that idea and using it again!